Jaden D. Quick, 18, of Kirklin, Ind. passed on Friday, July 27, 2018 as a result of an automobile accident. He was born April 18, 2000 in Frankfort to James & Kimberly (Crick) Quick. Jaden was to be a senior at Clinton Central High School, where he was involved in Student Council, was this year’s co-captain of the Clinton Central football team and was selected as the 2017 Team MVP. He was chosen to participate in the Clinton County Learning to Lead program. 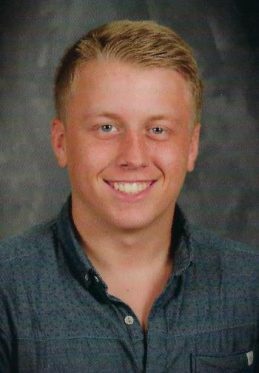 Jaden enjoyed hunting, fishing, golfing, Xbox, working on cars, basketball, was a Red Sox baseball fan, and a Green Bay Packer football fan. He also enjoyed spending time with his friends and loved his family. He had been working the past month for Bill Estes Chevrolet in Lebanon, Ind. Parents: James & Kimberly Quick of Kirklin, Sister: Chelsea Quick of Frankfort, Nephew: Kendrick Thompson, Brother: Brody (Alyssa Erwin) Quick of Murfreesboro, TN, Grandparents: Kathy (Kenny Waters) Crick of Kirklin, Cletis (Bridget Gunn) Crick of rural Kirklin, Patricia Quick of Kirklin, and Girlfriend: Layne Snyder of rural Frankfort. He was preceded in death by his grandfather, Jon W. Quick. This really saddens our family. You all are in our prayers. We have felt everyone’s thoughts and prayers. We are truly grateful for the love and support we have had through the loss of Jaden. So sorry.. Prayers & Hugs for All The Family & Friends.. Words cannot express the sorrow. My sincere prayers and condolences. May God grant you the strength to get through this most difficult time. Kim & Jamsey, Chelsea, & Brody and family I am so very sorry for your loss. May God’s Love and Peace be with you and comfort you. May Jaden’s love forever be in your hearts and may you cherish those precious memories until you hold him again. I will always be here for you Quick Family. I am thankful to have seen you all this weekend. Our Deepest Condolences to the Quick Family. Kim, Kathy, Diane, and entire family…I am so sorry for the loss of your son, grandson, and great nephew Jaden. He sounded like an amazing young man and you should be so proud. Please be comforted knowing, there are so many people thinking and praying for your family. May God be close to you and comfort you today, tomorrow, and beyond. So sorry for your loss . Thoughts and prayers through this difficult time . Words cannot express how deeply saddened we are for your entire family. Jaden was loved and will be missed by so many. We hope that the thoughts and prayers of this entire community can surround you and help give you the strength that you need to endure. Prayers for strength and peace to the entire Quick family. Jaden was an exceptional young man. Such a pleasant young man. In the short time he worked here, he showed exceptional character, and was just an all around good kid. Prayers for his family and friends. We were so saddened to learn of your brothers passing.You are in our thoughts and prayers.I pray for comfort and strength for the entire family. Kim and Jamsey my heart is broken for you. He was a son to be very proud of as I know you were. May your pain ease with time and the remembrance of him bring a smile to your face. Our Deepest Sympathies to you and your family! James, I cannot begin to imagine your heartache, you and your family are in my thoughts and prayers. May the Good Lord wrap his loving arms around each and every one who new and loved this wonderful young man !!!!! Prayers!!! You are all in my prayers. So sorry for your loss. Patty and family, Thoughts and prayers for you all of your family during this difficult time and the many days to come. Jim & Family, We are so sorry about the loss of your Son. Just know our thoughts are with you. You have our sincere condolences. What a terrible loss. Our whole team will be praying for your family. He was a great competitor. and a tough player. My heartfelt condolences. With tears and heavy hearts trying to see you in memories. I will not forget any moments you were with me. Always, loved talking with you. I will miss those hazel eyes and cute smiles. For, your brother, sister, mom & dad, prayers from all of my family & promise to stay close in such times. Anything I can do to help, would be my pleasure. Stay strong. Prayers for the whole family. I can’t even begin to imagine what all of you are going through. May God comfort you all and give you the strength to get through this tragedy. My heart felt condolences and prayers. May the good Lord wrap his loving arms around you all today, tomorrow and all the days to come. We are so very sorry to hear of your loss. Your family has been and will continue to be in our thoughts and prayers. Keeping you in our prayers, from the Eastern Football team, so sad to see such skill pass on. Kim and family, You are in my prayers. I can only offer my deepest condolences. So very sorry for your loss. All of you have been in my prayers. My thoughts and prayers are with you through this difficult time. We would like to offer our sincere sympathy to the Quick family. We lost our daughter Lindsey a year ago after a car accident. May God give you strength, peace and understanding in the days to come.